You still have time until the 15.04.2019 to become a Kystjeger. In this situation, if the captain of the tanker is found guilty for the accident, what does he risk? Is the same for the collision of any two ships, or do special considerations exist for military vessels. With the note that this incident occurred in national waters. In this situation, if the captain of the tanker is found guilty for the accident, what does he risk? I'm no legal expert, but in the scenario that the captain is found guilty of neglecting his responsibilities as a ship captain and inadvertently causing millions if not billions of NOK worth of damages, I think it's safe to say that we'd probably be looking at several years in prison. Is the same for the collision of any two ships, or do special considerations exist for military vessels. Don't think there is, but like I said, I'm no legal expert. They seem to suggest that the frigate was sailing "silently" with AIS and everything turned off when the collision occured. The tanker shows up on MarineTraffic over its entire path but the military ship has a big gap in its reported positions, only reappearing after the collision. According to one guy, tankers departing this harbor (oil terminal) are usually aided by several tugs and sail with a local Norwegian pilot at the helm, who then departs by helicopter once the vessel has reached the shipping lanes off shore. 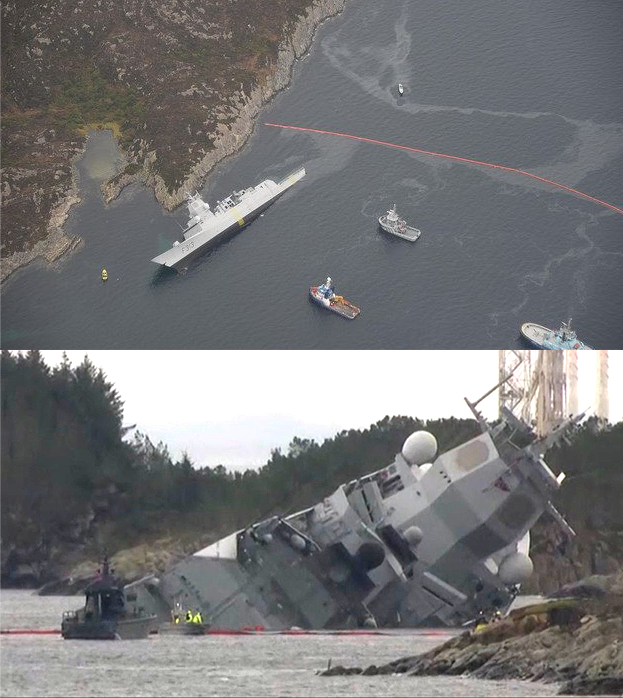 Anyway, in the footage they showed on NRK earlier she had major list with the starboard railing submerged, so even though they managed to prevent a total sinking by deliberately running her aground, the salvage operation ahead will be one feat. They managed to stabilize her at first, but now she's listing even more. Might be geo-blocked abroad, dunno. She seems stable up until then, but suddenly she rather violently flips over even more and the support vessels rapidly move back. Judging by the latest footage it appears to have been gradual ever since, up to the point where she is almost on her side at this stage. Last edited by moosefoot; 08-11-2018, 08:55 AM. But he doesn't think that the AIS blackout was the culprit. BTW, random but the ship he was stationed on, the frigate Oslo also sank after running aground, in the 90's. But that was due to free drift without power, and a subsequent salvage operation gone awry. Anyway, apparently they've established a large security zone and suspended deliveries from loads of oil and gas terminals/platforms. So this already has large ramifications. Man that looks pretty bad for the frigate. I heard on the radio just now that apparently both the tanker and the administration in charge of shipping safety there warned the frigate multiple times. But seriously hopefully thwy can salvage the ship and restore it. Fortunately no lives were lost, and assuming it isn’t cost prohibitive, they can most likely salavage and restore it. Luckily yes,I wouldn't have made a joke otherwise. The ship lying on its side, close to coast just reminded me of Captain Schettino. Oh little brother, the joke is about sinking a norwegian submarine, not a frigate. 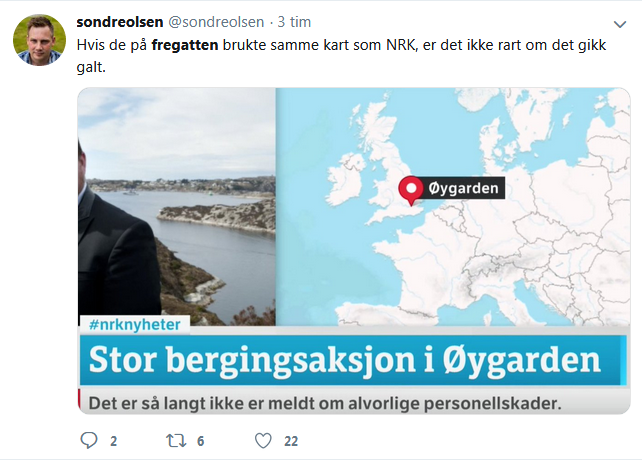 On the more serious side of things, Norwegian media has been quoting another civilian captain who was in the area at the time, and he said that the frigate couldn't be seen on their own surveillance radar, so at least that is testament that these RCS-reducing things that characterize modern warships work. But yeah, the "Coastal administration" says that they saw the ship and warned them about the tanker ahead, and the tanker itself also called out, so they clearly saw what was about to happen. Furthermore, the same administration said that AIS should be active as a rule in these waters, for all vessels over 24m in length, and that applies to military ships too. Last edited by moosefoot; 09-11-2018, 09:14 AM.